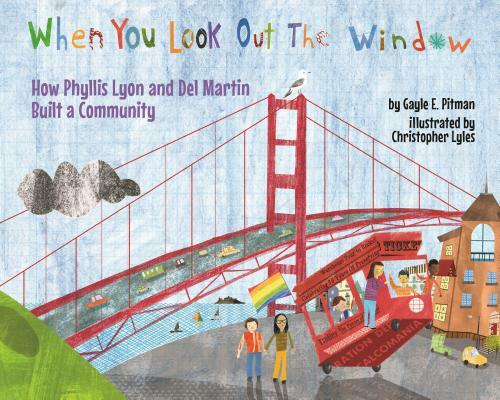 When You Look Out the Window tells the story of Phyllis Lyon and Del Martin, one of San Francisco's most well-known and politically active lesbian couples. Describing the view from Phyllis and Del's window, this book shows how one couple's activism transformed their community -- and had ripple effects throughout the world. Includes a Reading Guide that provides helpful historical context, and a Note to Parents, Caregivers, and Educators about the importance of teaching LGBTQ history and culture to children. This is a unique way to introduce children to untold stories in history while also being a clever tribute to two notable women. Phyllis Lyon and Del Martin were one of San Francisco's most well-known and politically active lesbian couples. They met in 1950, and moved in together on February 14, 1953 (Valentine's Day ). The house they shared for 53 years--and where Phyllis still lives today--located at the top of Castro Street, has a big picture window that overlooks the entire city. Each of the landmarks described in the story is part of the view from their house. Phyllis and Del left their mark on each of these sites, and they are described below. People who are lesbian, gay, bisexual, transgender, and/or queer (LGBTQ) are more visible and accepted in our society than ever before. However, anyone who wants to learn about LGBTQ history and culture will probably have to search for that information on their own. Many students have never learned anything about LGBTQ history. They may not have realized that some of the authors whose works they read (or whose works were read to them) were LGBTQ. They may not know that major discoveries and contributions to the fields of science, mathematics, and technology were made by LGBTQ people. And they may not be aware of the ways in which LGBTQ people have been oppressed, and what they did to fight back against it.